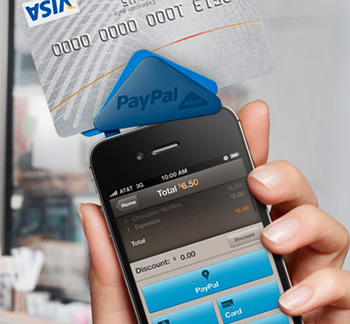 Earlier this week, PayPal mentioned plans to compete against Square, Intuit and other credit card payment processors. The company aims to become yet another way to process credit cards on the go for small businesses, offering a mobile card reader and competitive processing rates. Yesterday, the company unveiled its new PayPal Here service which includes a free card processing app and a triangularly-shaped card reader which attaches to most Android and iOS mobile devices. The device connects to your phone or tablet and allows you to swipe a credit card at any location where you have an Internet connection. Although hardly a new concept, PayPal intends to rock the boat with a lower transaction fee than its competition. The company is keeping things simple with no monthly fees and a universal 2.7% transaction fee. This means no matter what card you swipe -- even American Express -- you'll be charged exactly 2.7% of the total. Currently, mobile card processing pioneer Square, charges a universal 2.75% transaction fee. Another major player, Intuit's GoPayment, charges 2.7% per transaction but has higher fees for American Express. PayPal Here will be available in the U.S., Canada, Australia and Hong Kong. It still hasn't launched yet, but a handful of companies are said to be testing it. PayPal's move into the mobile credit card processing arena follows a recent brand refresh and a new partnership with the Home Depot. The International home improvement retailer recently began accepting PayPal payments at its POS terminals in the U.S. Although the Home Depot is the only big-box retailer that accepts PayPal directly, users can still sign up for a PayPal debit card which can be used just about anywhere a credit card is accepted.